Observation - Moorhen - UK and Ireland. Description: Heading to the water - a medium sized water bird with white streaks on flanks and red forehead, red beak with yellow tip. Looks like a moorhen. Heading to the water - a medium sized water bird with white streaks on flanks and red forehead, red beak with yellow tip. 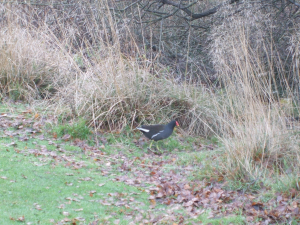 Looks like a moorhen.